Do you get heart palpitations? Unexplained tremors? Bloating after eating pizza or pasta? Do you have a skin condition that won’t go away? 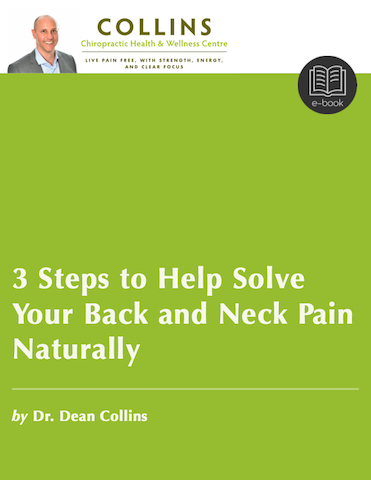 Do you have generalized muscle and joint pain? 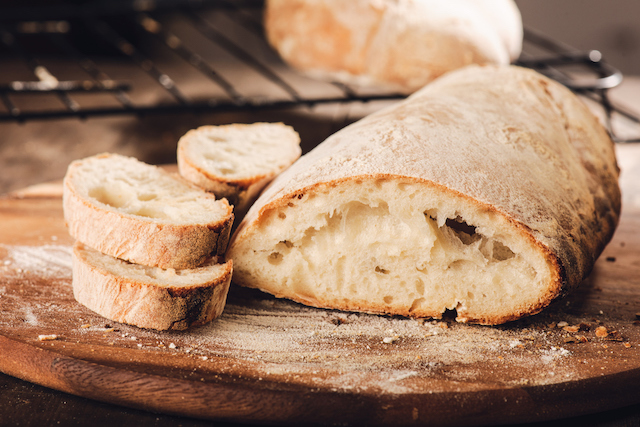 All of these symptoms can be related to a gluten intolerance and should be taken seriously. Testing yourself to see if you have gluten intolerance is very important to get healthier and stay healthy. Many of my patients know I take a hard line when it comes to eating gluten. The fact is, I have no problem with someone eating the odd piece of bread or eating that gourmet cake on your birthday if you can tolerate it. I don’t want to vilify gluten completely. I used to love gooey bread and desserts. So I understand the appeal of treating yourself and the joy it brings. As well, I know two really good people that followed their dreams and opened up a gourmet bakery shop recently. I like supporting family owned small business and I find their story inspiring. The cakes and desserts they make are an art form. I wish I could tolerate gluten, because I would no doubt be one of their regular customers. And I wish them nothing but success in their new venture. 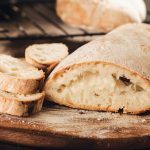 What does gluten intolerance mean and why is it important? Tolerating gluten means your immune system isn’t reacting (producing antibodies) to one or more of the gluten proteins. Gluten intolerance means your immune system is reacting (producing antibodies) to one or more of the gluten proteins. These are typical remarks I get from patients when I have discussions with them about gluten. Maybe you don’t have any of the above symptoms or conditions listed above, and you think gluten doesn’t affect you. Maybe you’re right. But what if you’re wrong? You could be setting yourself up for a serious health problem. I have two patients that have developed permanent neurological damage because of gluten. It’s called cerebellar ataxia. One uses a walker and one has an uncontrollable tremor in his leg. What has happened with them, is their immune system has produced antibodies to one of the gluten proteins. The gluten protein looks like the protein in part of the brain that controls movement (the cerebellum). Over time these antibodies started to attack their own brain tissue and now it’s left them in this state. My job is twofold: to help patients deal with their immediate health problems and to help my patients avoid chronic illness. Finding out if you are gluten intolerant sooner than later can save you a lot of heartache later on in life. The two numbers I circled in red mean he has a high number of antibodies to a specific gluten protein and an enzyme complex formed by gluten. The enzyme complex is associated with celiac disease. The protein he has antibodies to cross-react with numerous tissues and proteins, including myelin basic protein, synapsin, and myocardial peptide. Myelin basic protein and synapsin are important for proper nerve function. If you have antibodies to myelin basic protein there is the potential of developing Multiple Sclerosis (MS). So the Mom understood the importance of keeping him off of gluten. This young boy may have developed MS as an adult if he ate gluten regularly like the average North American. This was a very fulfilling case for me because it was all about preventing a chronic illness. What was also interesting about this case, is he said his heart felt funny when eating gluten. I expect he had some palpitations and his immune system was affecting the proteins in his heart (myocardial peptide). I used to get heart palpitations as well when I drank beer. Beer, in case you didn’t know, has gluten in it. 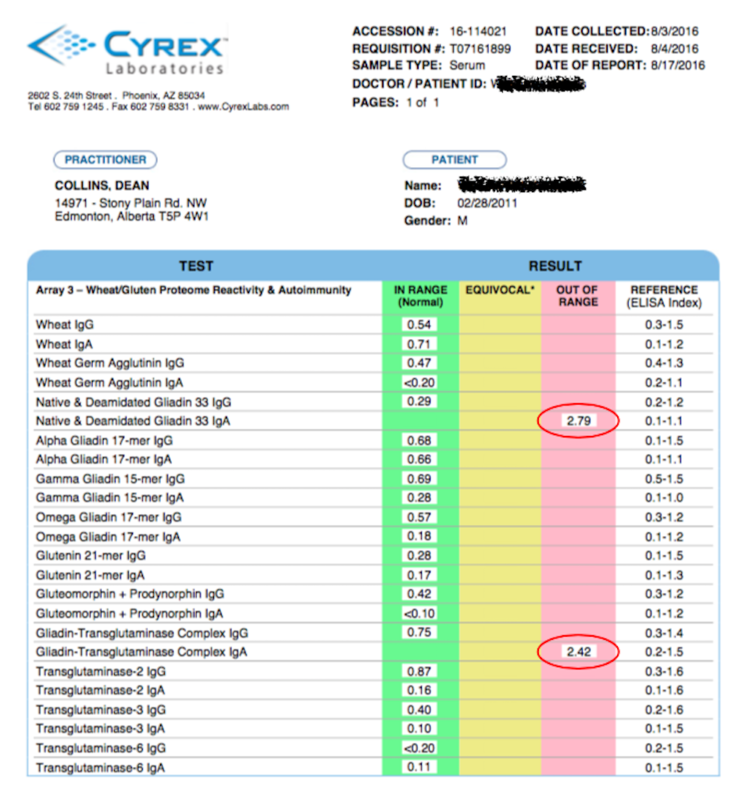 If you’re not 100% committed to going gluten free, make sure you at least get a Cyrex Array 3 test done. If the test is negative, at least you know that having the odd piece of bread or piece of pizza isn’t going to harm your health. On the flip side, if the test shows you are positive, it will help reinforce the importance of going gluten free. 1. where does one get a Cyrex Array 3 test? I order the kit in for the patient. They take the kit into Dynalife to get their blood drawn. Dynalife ships it. I get the results within 2-4 weeks. Then I go over the results with patient. If it’s somewhere else other than Edmonton we can can drop ship the kit, but we or the patient would have to arrange to get their blood drawn somewhere that would accommodate them and the Cyrex kit instructions. I can go over the results with them via video conference. Haha. Beer can be the cure for sure. Because I don’t tolerate wheat very well I had to experiment with a variety of gluten free beers out there. I have found a few I like, so I haven’t totally deprived myself of a cool golden goody on a hot weekend afternoon. What’s the cost of the kit and data analysis? Cyrex Labs charges $325 US for the Array 3 kit. The cost to interpret the Array 3 is $50 CAN. $200 CAN for the 1/2 hour consult to go over the results with the patient. I hope it will help a lot for all.Thank you so much for this amazing posts and keep update like this excellent article. OneDayTop has recently posted for HEALTH : Which are the best teas for health? Thank you Linda. Sorry I’m not an expert in herbs or herbal teas. I’m an expert in what herbs to use for particular conditions. I do know that green tea is good for you for a variety of reasons.